If you’re using Smartlaunch, it is recommended that you run it using Administrator privileges, with Windows UAC disabled. However, on Windows 8, even though you are logged in as an Administrator, that doesn’t mean every application that you run will be run as Administrator. Please see the screenshot below. The one on the left is when you right-click Smartlaunch Server on Windows Explorer, and the one on the right is when you right-click the shortcut of Smartlaunch Server on Start Menu. Both of them shows how to run Smartlaunch Server as administrator. Doesn’t that kind of tiring when every time you want to run Smartlaunch, you have to right-click and choose Run as administrator? Yes. Exacty. (Unless you don’t care and you just run Smartlaunch as it is). 3. 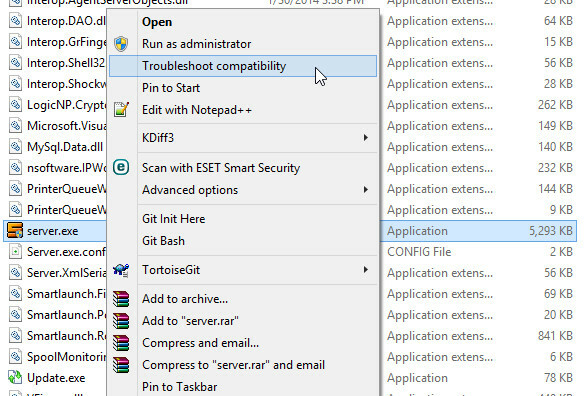 After Windows finished Detecting issue, select Troubleshoot program. 6. Select Yes, save these settings for this program. 7. After Windows finished Saving settings, you may close the window. Those steps above can be applied on any of Windows application that you have. However, if you ever found any other difficulties or you need assistance, please contact our support here.